Last week, I had the privilege of appearing on Genesis Office Hours, hosted by the incomparable Carrie Dils. At some point we started discussing some current projects, and I mentioned emails and RSS feeds, since it was one of the approximately 27,000 things on my plate last week. There were a few followup questions on that, so I thought I’d write up a tutorial on how to set up an RSS email campaign using MailChimp. I’ll also be following this up with a post about a plugin I’ve been working on to tackle another issue with RSS and emails and images, which can be pretty finicky. What is an RSS based email? Basically, you harness the power of an email marketing system and use it to watch your website’s RSS feed, which is automatically created and updated any time you publish a post. The email harvests your content from your post and spits it out as something pretty for your subscribers. The RSS feed itself is not a thing of beauty–go ahead, look at my RSS feed for a minute. What we do with our emails (and other feed readers such as feedly) is convert that mess into something that you and I can read. In the course of some followup on the RSS / email / MailChimp topic, I discovered that I have failed my own husband because I’ve never set him up with a fancypants email delivery system–poor man was still cranking away with Feedburner, which is fine, but kind of limited, and too easy to forget, as we did. And I don’t even remember how we were collecting addresses, but we certainly haven’t been doing that for quite a while. So even though he didn’t know it, he was more than ready for an update, and I figured it was a great opportunity to walk any of you who are interested through the wonderful world of setting up this kind of campaign. I’m doing this all with MailChimp, because that’s the company I adore, use, and recommend. I am not sure if Constant Contact supports RSS to email campaigns–last time I checked, they did not. I’m assuming you’ve already set up your MailChimp account and have your information more or less in place. If you want a sign up form for your site, and if you’re using the Genesis Framework, there is an easy to use little plugin called Genesis eNews Extended. Another good alternative is to use Gravity Forms with their MailChimp addon (you have to have a developer license for Gravity). 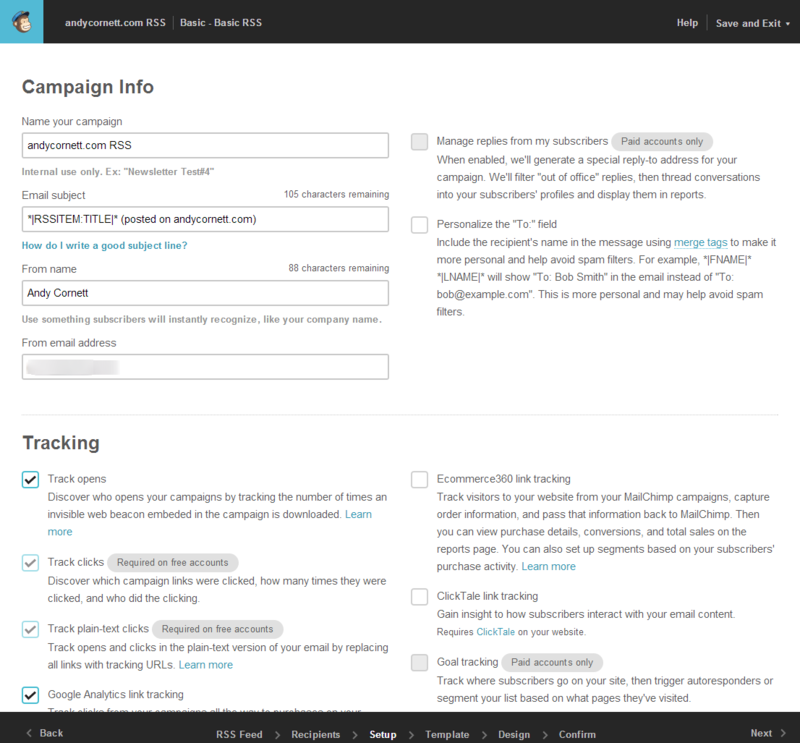 To get started with an RSS email, go to your campaigns in MailChimp. Even though this is going to send out many emails, it only counts as one actual campaign. Click on the button in the upper right to create a new campaign and select RSS based campaign, which is going to give you the options you need. The first step is to enter your feed address–make sure it’s a valid feed. If you’re using WordPress then it’s usually just your site’s URL followed by /feed/. 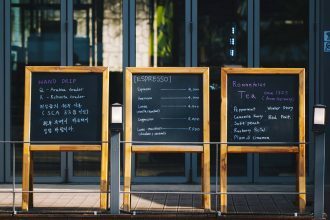 Depending on your setup and site, you may have multiple feeds–you can actually view a feed for each category on your site, or if you have a date based custom post type, it will have its own feed as well. You’ll also decide how often you want to send emails. Do you want the email to go out every day, basically anytime you create a post, or maybe less often, such as once per week? Most RSS based emails probably will be daily, but please note that this doesn’t mean you’ll be sending an email every day! MailChimp will only send an email when you publish a post. If you choose weekly, it will send all of your posts from that week in one email. The next screen is where you get to start making some choices–what’s your subject line going to be, from what email address are your emails coming, and tracking the performance of your emails. If you use Google Analytics, go ahead and check the appropriate box here for that–we want all the data we can get, remember? The next choice is to select your email template. Scroll to the end of the template choices for the ones which are already preconfigured for RSS, although if you’re good with the code, you can probably use any template. It’s easier to start with a preconfigured one. One cool thing about using MailChimp for this is that you can add a block of more static content to the end of your email–for example, I have a client who self published an ebook, and his emails have an image of it, along with access instructions, since it’s for email subscribers. You can also include sharing buttons and links to your website and social media accounts too. One thing which is easy to miss in your emails is the preheader–the little tiny area at the top. The first part of it shows in many email clients as the preview of the email. You could use the RSS merge tags to show the title of the post, or you could put something more generic, such as “the latest post from Robin!” The other half of the preheader is for people who are having trouble with your email, if something’s wonky and the images aren’t showing, for example: click the link and your reader will go to the copy of the email which MailChimp keeps for you on their servers. However. If the email looks wonky on an RSS email, where the content is coming from my site, don’t I actually want these readers to go to my site if they click anything in the email, rather than somewhere in the MailChimp labyrinth of archives? So, I change this link to be the RSS item link as well. That’s the hard part all done–now you absolutely want to preview your email. This opens an overlay window and shows you what your most recent post would look like as an email, both on a desktop client and on a phone. If everything looks great, then you’re almost done! If something looks wacky, you need to decide if the whack is happening on your site, or in the email, so that you know where to go to fix it. MailChimp is going to copy over your site’s HTML, so any headings will still be headings, and bold and italicized text will still be bold and italicized. If you have bad formatting form on your site (spans full of font-family and font-size and empty lines and things which really shouldn’t be there anyway), MailChimp will copy that over as well. Once your email looks good in the preview (you can preview this as many times as you want), you absolutely must send yourself at least one test email. Better yet, send yourself a few, using different email addresses and email clients (so, Yahoo and Gmail for example), because different clients behave differently–and they’re much less flexible and forgiving than any browser. Outlook, for example, is notoriously awful with how it handles images, and there is very little you can do about that, although I’m working on that for my next post. MailChimp does limit the number of test emails you can send per campaign, so if you think you’ll be editing a lot of things, trickle the test emails. Once your email looks good to you (don’t forget to click links and make sure they’re correct, too! ), you can confirm and activate your new campaign. If you pick daily emails, MailChimp will only send the first email if you have a post which is less than twenty four hours old. Weekly emails will look at the last seven days. After the first email goes out, subsequent emails will be sent daily/weekly, and MailChimp is smart enough not to send out the same post twice. Even after your campaign is up and running, you can pause it and edit it–if you need to change the header image, or colors, for instance, or if you opted for a block of static content which isn’t coming from the feed, that may need to changed periodically. Otherwise, this is a fire and forget campaign, and you are off to the races! There are more issues to consider, especially regarding images, which we touched on during Genesis Office Hours, but it’s worth its own post, and I have more testing to do. So check back in next time! Any suggestions for getting Social Share buttons into a template without having them link to the MailChimp archives? Hey Jeffrey! That’s a great question. If you are using the *|RSSITEM:TWITTER|* *|RSSITEM:LIKE| merge tags, they do actually link directly to your post, not the MailChimp archives. If you hover over the link in the email, it doesn’t look that way, but I believe that’s because it’s sent through MC first, partly to help you with your campaign tracking in MailChimp itself (you can see what links people click), and partly (at least for links which go to your site) so you can see where your site traffic is coming from. I checked these tags on several emails from different RSS feeds in my inbox, and they all opened a new Twitter tab which prepopulated a tweet with the post title and a link directly to the post on the site. I am not sure that it’s possible to do truly custom sharing buttons, if that is what you’re asking, since the share merge tags are the link plus the button all in one tag. There are some alternative tags to the two in my template. One is *|RSSITEM:SHARE|*, which is supposed to produce a block of sharing links–it seems to do a huge “everything but the kitchen sink” block of buttons. You can specify which ones it shows, though, by modifying it, something like: *|RSSITEM:SHARE:Facebook,Twitter,Digg|*, which seems like a better option to me. The buttons are small but they aren’t quite as frumpy. Thank you for your advice and taking the time to respond. Great, Jeffrey, thank you for sharing! For those who want a little more granular control, that seems like a good way to handle it. I confess, I have never bothered to look into how to create a facebook (or other service) sharing link. …and thank you as well! 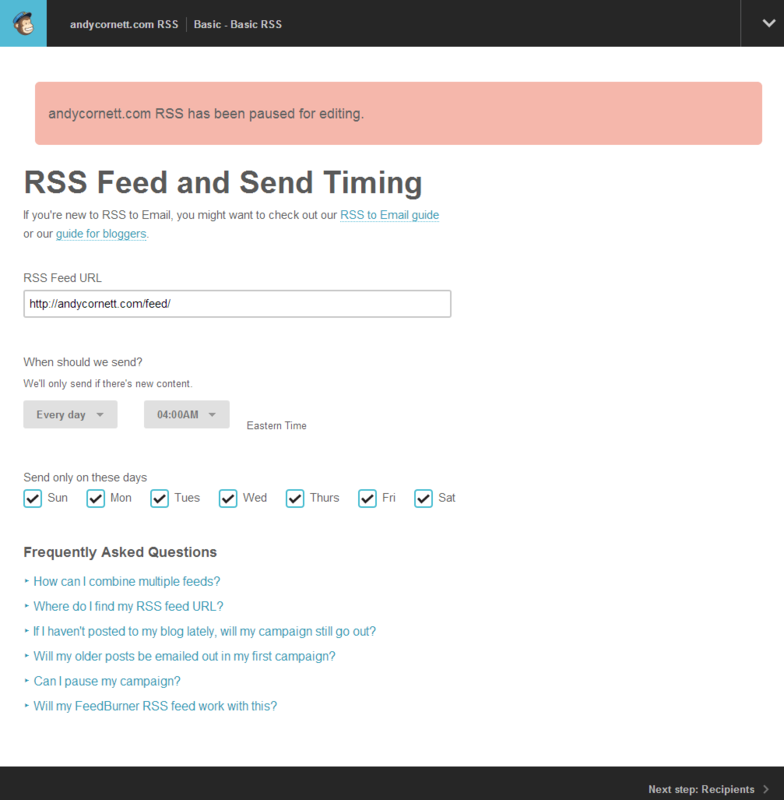 Does Mailchimp rss to email campaign send only once – when I press publish post in WordPress – or also at update post? I sometimes edit posts after publishibg but don’t want then to go out to subscribers again. Hans, that’s a great question. If you go back and update a post which has already been sent out by email, or which is simply just an older post, MailChimp will not send it again. The exception to this might (and I am not 100% sure on this) be if you were to change the date on the post as well. All that MailChimp can see of your posts is your raw XML feed (probably located at yourcoolsite.com/feed), and whatever data is in that. And it only pulls the most recent post(s) based on the rules and information you give it. So if you have MailChimp set up to send out daily emails, for example, it’s going to send out emails every day, but only as long as there are new posts from within the last 24 hours. If you publish two posts in a day, MailChimp will (I believe) send them both. If you edit a post which MailChimp has already sent, it won’t send it again. And if you pause your RSS campaign, publish a post one day, and restart the campaign a week later, it’s not going to send out the post which was published a week ago and not sent. If you set a weekly or monthly email, it’s going to apply the same kinds of rules, but on a different time frame. So, if you publish a post, it goes out by email, and then you go back and edit it, MailChimp should ignore it, based on my understanding of how it works. I have some older blog posts that were published and never sent out through MailChimp. What is the best way to send out an older post to a current list through the RSS template? Dave, that’s a great question! I’m honestly not sure. I know that if you try to change the date on a post that MailChimp has already sent out, it won’t send it again, because they have some way to be able to tell that it’s been sent (probably using a unique identifier on the post), but I don’t know if you could get it to send out an old post just by changing the date. I would try it on a development site, with a list of one (yourself), and see if changing the date on a post gets it sent or not. It may be that the only way to get MailChimp to do it is to publish as a brand new post, which is probably not what you want. Jess, I’m leaving my original thought below in case it helps someone else, but looking at your raw feed, the images are not in there for MailChimp to pull. I see that you are adding a featured image to your feed output, but something is happening to remove all of the images in your posts. 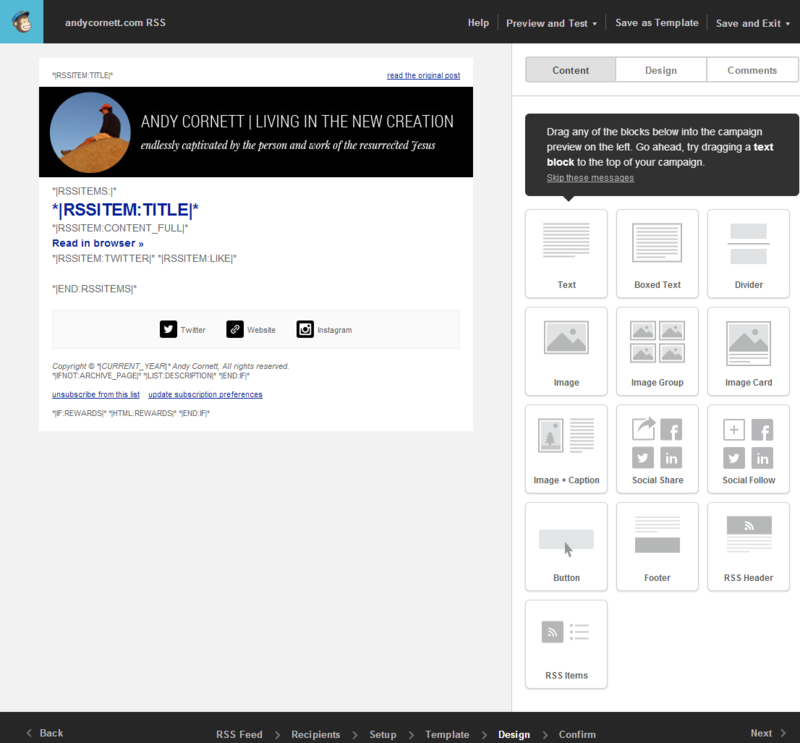 Are you using a plugin to modify your RSS feed, other than however you are adding the featured image? If you want a second pair of eyes, feel free to contact me directly and I can help look through what might be going on. I would double check your MailChimp template tags. You want to make sure you use *|RSSITEM:CONTENT_FULL|*, not the similar looking *|RSSITEM:CONTENT_FULL_TEXT|* (full content, but text only) or even *|RSSITEM:CONTENT|* (which actually is your post summary). If the full text is coming through, though, it’s probably not that last one. This has been a tremendous help! I had everything all set up and then the morning of my post going out, the email went out but it didn’t have my recent post content. In searching for help, I found this article! I was using the wrong template! I wasn’t using an RSS template. I’m trying to use *|RSSITEM:TITLE|* as my subject line but for some reason it’s choosing the first post instead of my most recent. Do you know why that would be? Any help or insight you could offer would be greatly appreciated. Hmmm, that’s a strange one, Kimberly. Is your email set to pull just one post, on a daily basis? I can see the subject line getting muddled if the email is set for more than one post per email, but if it’s only one, it shouldn’t look at anything else in the feed. I think, but cannot currently verify, that I’d read someplace that using an item merge tag in the subject line isn’t totally foolproof, although I’ve generally had no issues with it myself. I would just double check that it is only looking at one post? 1. The excerpt text of my posts start to the BOTTOM right of the featured image, though it should start at the TOP right. 2. How do I get a blank line between two posts, so it doesn’t look that squeezed? 3. How do I change the color of the title link? There is a bit more information on the MailChimp announcement of that feature. If you add a <br /> after the content line, that will force a line break, which should help with the spacing. Hope that helps! Thanks for your quick answer. The tag after the content line worked like a charm, and I was also able to style the title the way I want. Still not working. I now can see, that there is space to the left where the image should appear, but it’s just not pulling it. I’m wondering if it has something to do with that I should also set up a new feed (as mentioned in that MailChimp announcement). But first of all they don’t explain in detail how you do this, and then I also don’t get the part where he says “wherever there’s an image that you want to control in your MailChimp template, mark it with media:content”. He then shows an example with one URL… but I don’t wanna have to add this “media:content” snippet each time I publish a new post. Can you see the code I inserted in the text above? I can’t – is there a trick I have to apply to show the coding? No, sorry, your code isn’t showing. You might try doing a gist on Github and sharing the link. I know I did a simple div, not the tables thing (although who knows how it might have looked in Outlook). And I did not do the media:content things, either. You might instead consider using a WordPress function to add a featured image to your excerpt (description) and having MailChimp use those instead. I wrote a tutorial on it which might help. thanks a lot, I’ll have a look at your tutorial then. I’m using the RSS campaign option on Mailchimp to send my blog readers weekly updates on our latest posts. Somehow this doesn’t work anymore. I have not made any changes to my rss feed, but this is where there seems to be a problem, as I am subscribed to my page’s rss feed, and it was not updated when I published my last post. I added a few new plugins over the last days, but these shouldn’t have made an impact, right? I just found the issue! It WAS a plugin that was causing the issue (WP Conversion Boxes – Email Optin & CTA Boxes). No idea why, but I’ll just look for a new newsletter subscription tool. I’m glad you found the source of the issue, Michaela! I don’t have much experience with similar plugins, but one I have used in the past is OptinMonster–might check that one out. Good luck! Such a clear tutorial – I wish I had found this before I muddled through doing this on my own. I set up the RSS email campaign to send daily when it sees new posts, it was not paused, yet it stopped sending after the first email. Do you have any idea why this would have happened? I since went back and paused and checked it, but could find nothing I did wrong. Hoping you’ve encountered this issue and may be able to help me! Sorry, Carly, I have not run into that one before–I’d have to dig into the email and feeds by hand to see if I could diagnose. I’m assuming that you set up the campaign and it sent successfully before your “cheating” post, and then that one did not send? Is that what you’re experiencing? The feed looks OK from what I can see, so I would double check your campaign settings, possibly the feed link is set to a category, which the latest post didn’t have, or something funky like that? Thanks Robin, that’s exactly what happened – I’ll check to see if the category is set to something. After I went in and paused and checked it yesterday, it sent out today with yesterday’s post, so fingers crossed it will work okay now. Thanks for the quick reply! Thank you Robin! I read this article long before I needed it, but now I am so glad I saved it. Your instructions were a welcome alternative to Mailchimp’s article, or maybe it was just confirmation. In any case, I was originally overwhelmed but now I’m having fun with it. I am setting this up on my new Rainmaker site which of course you cannot add plugins to, so the RSS feed is the way to go. Having fun with the templates now and I hope to be testing my emails soon. I have set up MailChimp to send a newsletter once a week to my subscribers but I wanted it to send all the posts that have gone live throughout the week. When it went out this morning and last week it only sent my most recent post. I used the “RSS Items” button by pulling it over once but do I need to pull over more than one for each day of the week that there might be a post? Thanks! No, duplicating that section would probably just duplicate the post in the content. A couple things to check: are you using a daily schedule with only certain days checked, or a weekly schedule? and do you have the email set to send the full content (which may not support multiple posts) or excerpts? My gut inclination is that your issue is with the first one, as I believe the daily schedule only sends posts from the previous 24 hours. Weekly only sends from the previous week, etc. This was by far the most helpful information on how to integrate my blog with mailchimp. Thank you! I am not a tech person so trying to get all of this up an running for my ministry is really time consuming and taxing. I think I’m getting there. A couple of questions. 1. How can I get back to where I set up the frequency? I think I did it correctly but I can’t be sure and I can’t find where to get to that information. 2. How do I add a comments section to the bottom of the email? Can those link to my actual blog site so if someone leaves a comment it will show up on my blog? I found the tag for comments but am not quite sure what to do with it. The frequency is in the first one, the RSS Feed. As for a comments section in the email, I’m not sure that you can do that. You want all the comments to be made on your site, so you really just want to direct your email recipients back there, so that any conversation happens on your own territory. This is a very helpful post. I have been having trouble with getting the links to specific posts to populate. I’m new to RSS feeds, so I have been combing through forums to try and solve this problem. Your post is the only one that has come close so far. Thank you for posting this. I’m still having trouble with this. Can I get your feedback on why my code is apprearing rather than the linked title? Are you entering your merge tags in MailChimp’s visual editor or switching over to the code/HTML view? You may need to do the latter. Also, the FEEDBLOCK tags are slightly different than the standard RSS tags–I have only used the latter. I’m not sure if you can use both in the same campaign as you appear to be doing here. You may want to double check that as well. Hope that helps! Thanks for such a great article. After reading this and applying the stuffs and previewing the email templates for about 20-30 times, I finally now have a perfect template for myself and now it will also send email to all my subscribers whenever a new post is published. Had this post not been available, I might not have been able to do that work. All thanks to you. You are the best. Keep rocking! I am wondering how to change the hyperlink color of the recent posts in a campaign…Do I need to wrap the text with something to get this to happen? Right now the links for the following all show up blue. I’d prefer them to be my colors. Hey Katie! That should all be controlled by your MailChimp template, so I would look there. Some email clients are better than others about honoring things such as link colors in email templates. I’m having problems with this, too, for one of my clients’ sites. I have all the link colors in the MailChimp template design set to a green, and all the links show as green in the MailChimp preview. But when the email is sent, some of the the links (Recent articles is one area) show as blue. The other link that shows as blue is the link that is setup by the “Read More text” field in your (GREAT) plugin, Send Images to RSS. That’s a tough one, if the links are all styled the same in the MailChimp preview, but showing differently in the email–there won’t be anything you can do from the site end, short of using inline styles on all of your links, which sounds bad to me. I would double and triple check with MailChimp, but unfortunately, some mail clients are just nicer than others about honoring your styling. Great tutorial! There’s just one issue I can’t find an answer for anywhere. No matter how I edit the code, there’s a huge empty white space between the end of the blog post and the “read in browser” link. I have no idea how to get rid of it. That’s a tough one to diagnose, Rose–you can try using the MailChimp text/code editor and make sure there are no extra line breaks there, but it may be difficult to get rid of. I’m assuming that there are no extra lines at the end of your actual post, which can happen, in which case the issue would be outside of MailChimp. Interesting, Pojda. I have reported a different issue with that featured to MailChimp. I think I would avoid using the feature for now. Thank you for sharing this! THANK YOU POJDA!!!! I have spent hours trying to figure this one out and did a final google search as a last ditch effort before abandoning mailchimp altogether…. This did the trick – so grateful you took the time to comment and share your story here! And it has stopped updating as of last March. I have generated the URL for the campaign archive on Mailchimp but when I try to replace the one above with the new one …the page is blank. I am not a code person and have been reading the forums and Mailchimp site trying to figure out how to get the newsletters to automatically update on website. Any thoughts would be terrific. Joy, there isn’t much to troubleshoot with the MailChimp script–I mean, there isn’t anything you can do to it if it is not working. My only suggestion is to double check that the new campaigns (since March) are being added to the correct folder in MailChimp, since that archive code is based on their folder system. My guess would be that the more recent campaigns are either in a different folder, or have not been filed at all, but that’s my only guess. Thanks for your posts, they are really helpful. I have an RSS to Email campaign that gets sent out from my WordPress blog. When it arrives in my subscribers inbox , the title/subject always starts with “Posts from….” is there anyway to edit this to a custom title? Yes, you can change that–it’s on the Setup tab of your MailChimp RSS campaign. The second box is for the email subject line, and can take merge tags, so I usually have it set to the post title (because I only email one post at a time–if you do multiple posts in one email, you’d definitely want a different subject line). Just a quick note to say thank you, Robin! I was frustrated as heck trying to follow MailChimp’s instructions, but you had me up and running in less than a half hour, including all the small-but-important tweaks to the code you suggested. Great stuff, and I’m adding myself to your RSS (of course)! Hi Robin! I have been using my RSS feed for an email campgain for a a year now and it’s been fine. I just had my theme customized under Genisis and while the feed worked fine, the “read more” or “continue reading” at the end of the paragraph isn’t there. All that’s showing up is (…) with no way to link? Hey Kathy! It looks like your site is set to use the WordPress default excerpt, which is where that […] is coming from. For the most control, you can change that by using a function to modify the excerpt in your feed (although I am seeing a link back to the original post after the excerpt; it looks like the Yoast SEO RSS read more sentence to me). I think the filter you would want is 'excerpt_more'. Another option would be to use my Send Images to RSS plugin, which now works with excerpts (it did not at the time I wrote this post). It will replace the Yoast sentence with whatever you want for the read more, attempt to trim your excerpt at the end of a sentence rather than the default 55 words, remove the […], and give you the option of adding the featured image to your RSS excerpt, and therefore your MailChimp campaign. Great post, and website, Robin. Mailchimp is powerful but quite hard to find your way around so this sort of information is invaluable. I have an RSS blog to email feed set up for every day posting (if there is a new post) but wondered what would happen if I posted two posts in the same day. I was expecting either to see both in the same email, or two separate emails (probably the former). However what I received to my test email account was just the latest post, and the other post from the same day was not even in the Recent Articles list – it seemed to have been left off completely. One thing I would double check is your MailChimp template. I do not see that you have an opening *|RSSITEMS:|* tag, which may be part of the issue. The best way to reduce the size of the images in your emails is to reduce the size of the images in your feed. I’m biased, because I wrote it, but I would use Send Images to RSS to handle this. It helps make sure your RSS feed uses only well-sized images. I sometimes will create 2 posts in one day. Is there any way to get Mail Chimp to sent both of them automatically? 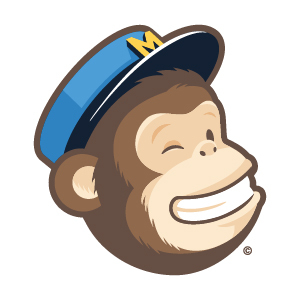 MailChimp will send unsent posts, so if your schedule is to send from MailChimp daily and there are two posts unsent, then both should be sent.